Lego Rock Band: just another brick in the wall? Lego used to be a noun and referred to the bricks themselves: we had Space Lego and Harry Potter Lego, for example, and they were different kinds of Lego but they were still Lego. Then it was an adjective, applied to things that weren't actually Lego but wanted you to be reminded of it: Lego Star Wars, Lego Indiana Jones - computer games with a Lego theme. Now, it seems to have become just a meaningless prefix. Lego Rock Band, recently announced by Harmonix will be Rock Band but with Lego minifigs instead of other, slightly more realistic, 3D rendered rockers. Oh and the stage will probably be covered in bumps too. 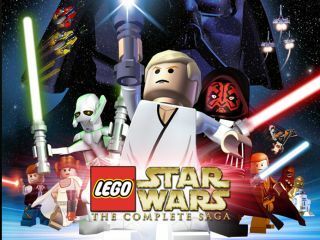 The Lego Star Wars game was a stroke of genius because there was already a strong science fiction tradition in the Lego universe - both generic and Star Wars licensed. The Star Wars films also have lots of ships and robots and bases that translate well into Lego. Lego Indiana Jones was less successful because the franchise is much more character driven, but you could still ride around on different animals and vehicles, build structures to unlock new areas and pick up little gold studs that were scattered every time you smashed up the scenery. Lego Rock Band is just going to be Rock Band. None of the core game mechanics have anything to do with building and, generally, no one pays much attention to what's happening on stage because they are too busy watching the coloured blobs scrolling towards them on the fret board. You can already customise your rock avatar; doing this with Lego won't add anything new and will in fact greatly limit your choices because minifigs are all the same basic size and shape and can only change their hat/hair, head, top half and bottom half. Lego Battles is even worse. The Nintendo DS screen is far too small for an RTS game to capture anything recognisably Legolike. It might well be a passable game, but Lego, it is not. I'm an enormous and lifelong fan of Lego - I don't know any man who isn't - and this obviously presents a terrible temptation for marketing departments. Connecting your brand to Lego is like dipping it in chocolate; it feels like it should always be an improvement. But this is not the case. And it won't be long before the prefix 'Lego' is just another way of saying jumping the shark. Lego Sonic the Hedgehog, anyone?